What happens if you move to a new town and your house is haunted? Andres is about to find out! Andres Miedoso—his last name means “fearful” in Spanish—is “definitely not the coolest and bravest kid in the world.” In fact, Andres likes normal-boring and understands normal-boring, because he is normal-boring. But when the brown-skinned, curly haired Latino child and his family move to Kersville, he finds out his new home is anything but normal-boring. 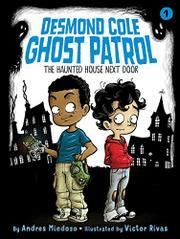 Fortunately, his next-door neighbor, a black boy named Desmond Cole who is the same age as Andres, is “the coolest, bravest kid in the world.” Desmond’s business as stated on his business card is “Ghost Patrol.” How lucky should a boy feel to live in a haunted house? Very—if you’re Desmond. Not so lucky if you’re Andres. But when the ghost eats a lasagna that makes him sick and tells them he’s been moving from house to house, Andres feels sorry and invites the ghost to stay as long as he promises “not to do any spooky stuff.” A deal is struck, a friendship is born, and a new series for chapter-book readers gets off to a good start.